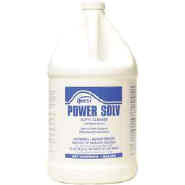 An amazingly strong cleaner that uses no caustics, acids or abrasives, Power Solv Butyl Cleaner is also nonflammable. Dilute up to 20:1 with water for general purpose cleaning. Removes all kinds of dirt, grease, oils, ink and other soils from concrete, carpet, ceilings, walls, metal surfaces and more.